If you or your child recently got a dental retainer or Invisalign Aligner Trays, it is very important to clean it properly; otherwise, bacterial buildup could ruin your retainer and make you ill. Here's the bottom line: You need to clean your retainers or Invisalign aligner trays EVERY SINGLE DAY to keep them sparkling and germ-free. There are many easy home methods you can use, and some convenient products you can buy for this purpose. These products work well for every type of retainer, Invisalign trays, and other dental appliances. 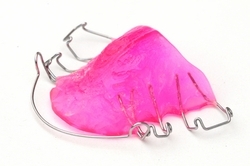 If your retainer contains parts that are soldered on, you must be use caution when soaking it. Many of the ingredients in retainer soaking solutions will crumble metal solder over time. If you're not sure whether your retainer contains metal solder, ask your dentist or orthodontist. Does your retainer smell? If so, it has bacterial buildup (the bacteria cause the bad odor). Cleaning your retainer or aligner tray every single day will prevent this bad smell, as well as potential illness caused by putting a dirty appliance into your mouth! Is your retainer covered in a hard white film? This white film is plaque (tartar) – the same stuff that you brush off your teeth every day. If you don't clean your retainer daily, that plaque will harden and be almost impossible to get off. A new retainer costs, on average, about $250. It's in your best interest to keep it clean and germ free! Here are the products and methods you can use to clean your retainer. If you're still confused about how to clean your retainer after reading this article, see our Retainer Cleaner Finder. 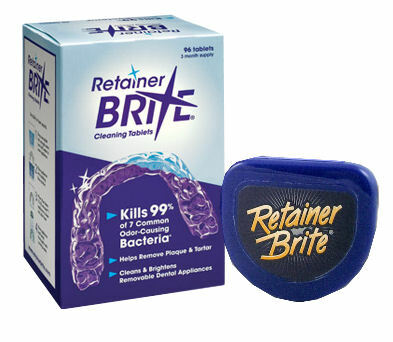 Retainer Brite – Retainer Brite is an effervescing (fizzy) tablet which kills the bacteria on your retainer and helps prevent white plaque buildup. Each tablet is individually foil-sealed, so it's easy to take Retainer Brite with you to the office or on a trip. Just drop one tablet into warm tap water and soak your retainer or aligner tray for 15 minutes. Then rinse it thoroughly with warm water. Optionally, you can use a cordless sonic cleaner, which helps drive the product into all the tiny crevices of your retainer for an even more thorough cleaning. This is the product that my family and I use the most, because we travel a lot. If you already have white plaque buildup on your retainer, Retainer Brite might not get it off. It is best for preventing the plaque buildup with daily use. Click to buy Retainer Brite. 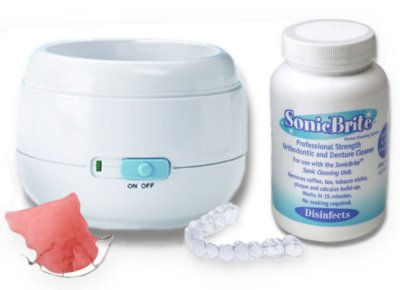 SonicBrite – SonicBrite is a retainer-cleaning powder which comes with a high-quality sonic cleaner. It is a very strong product which not only kills bacteria on your retainer, but does an excellent job in removing the most stubborn white plaque buildup. (If your retainer or aligner has a lot of white plaque buildup, you may need to clean it several times with SonicBrite before the plaque is totally removed). To clean your retainers or aligners, measure one spoonful of powder and place it into the sonic cleaner along with warm tap water. Place your retainer into the liquid and turn on the unit, which runs for 15 minutes. After the unit has finished running, take out your retainer and rinse it with warm water. Click to buy SonicBrite. 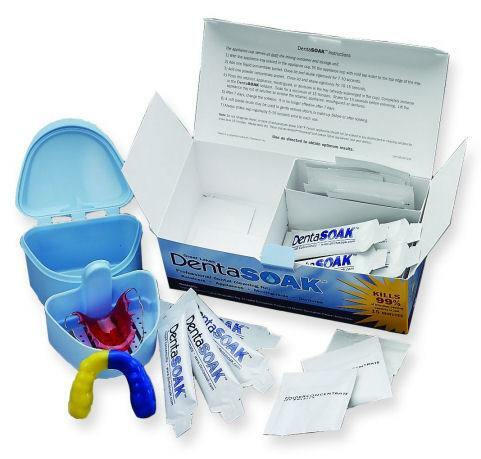 DentaSoak – This is one of the few “cold water” retainer cleaners on the market. You mix it once and use the soaking solution for an entire week. It's great for cleaning any type of retainer, aligner tray, or dental appliance. A 15 minute soaking in DentaSoak kills bacteria. It also removes stubborn white plaque buildup after several uses. And, if you're concerned about allergies, DentaSoak does not contain Persulfates. DentaSoak comes with its own special mixing cup and is great for anyone who doesn't want to mix a new cleaning solution every time. Click to buy DentaSoak. 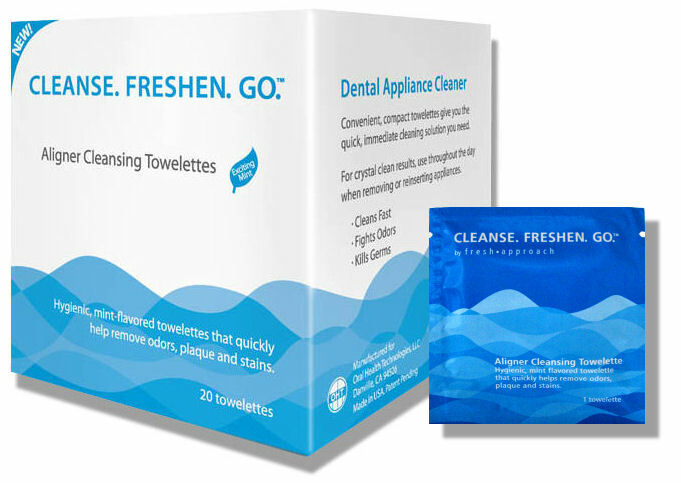 Cleanse Freshen Go – If you're taking your retainer or your aligner trays in and out of your mouth continually, you will want the Cleanse Freshen Go retainer cleaning wipes! The wipes are great for those times when you need to clean your retainer and don't have access to running water. Cleanse Freshen Go also makes a retainer cleaning spray. The wipes and the spray don't contain Persulfates and have a fresh minty flavor. Click to buy Cleanse Freshen Go. OAP Cleaner – OAP is a Persulfate-free retainer cleaner that kills 99.9% of bacteria on your retainer within 60 seconds. OAP Retainer Cleaner comes in two forms: gel and foam. We recommend the foam for clear Invisalign aligners and clear Essix retainers because it quickly spreads into all of cracks and crevices. The gel is great for Hawley retainers and other types of removable dental appliances -- even ones that contain metal solder. Click to buy OAP Retainer Cleaner. There are several inexpensive methods for cleaning retainers using household products you may already have on-hand. Never use caustic chemicals like bleach to clean your retainer – you could risk ruining it. Do not soak your retainer in soda (believe it or not, some people think that Pepsi or Coca-Cola can clean retainers, which is not true). Soaking your retainer in soda will only be a breeding ground for more bacteria and will not actually clean anything. Brush with a Soft Toothbrush – Each night, simply use a small bit of non-abrasive toothpaste (regular, non-whitening) or dishwashing detergent and brush your retainers with a very soft bristle toothbrush. This will help keep your retainer clean, but it will not kill the harmful bacteria and won't prevent white plaque buildup unless you brush the retainer extremely thoroughly every single time. If you have a clear Invisalign aligner tray or a clear retainer, brushing with a toothbrush is not recommended, as it will put small scratches onto your retainer, which will eventually turn it cloudy. Never use baking soda to clean your retainer, because it is too abrasive and will scratch it (also, baking soda does not kill germs). Vinegar and Water Soak – Mix equal amounts of white distilled vinegar and warm tap water in a cup and soak your retainer for 15 to 30 minutes. Then brush your retainer gently with a soft bristle toothbrush, and rinse it thoroughly in warm water. Vinegar does have some germ-killing capabilities, but the disadvantage of this method is that your retainer will not taste or smell very good afterwards. Vinegar also will not prevent white plaque buildup. Hydrogen Peroxide and Water Soak – Mix equal amounts of warm tap water and 3% hydrogen peroxide, and soak your retainer for at least 30 minutes. Then rinse thoroughly with warm water. Hydrogen peroxide will kill some bacteria, but it will not be very effective in removing white plaque build-up. Mouthwash Soak – You can dilute equal parts of mouthwash and water to temporarily make your retainer smell fresh and kill some of the bacteria. However, mouthwash usually contains some amount of alcohol, which can be harmful to the plastic of your retainer. It's OK to soak your retainers in mouthwash occasionally, but regular soaking in mouthwash could harm your retainer. Denture Tablets Soak – This method is not recommended. Denture tablets are not formulated for retainers, and will eventually turn your retainer yellow. It's OK to use them in a pinch once in a while, but continual use will not be good for your retainers. Lynn S. is the founder and owner of DentaKit.com. Shortly after getting braces in 2001 at age 41, Lynn realized that there was no convenient way for her to find the orthodontic products she needed locally. She created DentaKit.com to give orthodontic patients easy access to products that would help keep their braces and retainers clean and comfortable. Along the way, she also created ArchWired.com and its Metal Mouth Message Board to provide vital information and an online community for adults who have orthodontic braces. Lynn has a degree in Communications and Journalism, with a focus on scientific writing and research. Before founding DentaKit.com, she was a technical writer and technical trainer for various high-tech companies in Silicon Valley. Since starting DentaKit.com 15+ years ago, she has attended many meetings of various dental associations, and has read and researched extensively on a variety of orthodontic and dental subjects. The articles she writes are always vetted by one or more orthodontists or dentists before they are published. Retainer Brite 1 Year Supply 384 Tablets - ON SALE!